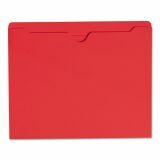 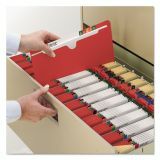 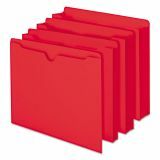 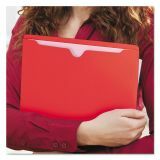 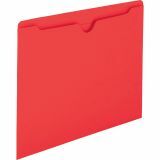 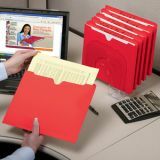 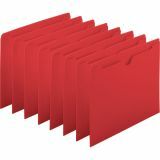 Smead Colored File Jackets w/Reinforced 2-Ply Tab, Letter, 11pt, Red, 100/Box - Color-code your projects using top-tab, colored file jackets. 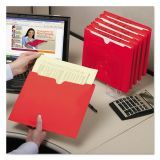 Closed on three sides to protect contents and keep materials from slipping out, file jackets are great for taking files out of the office. 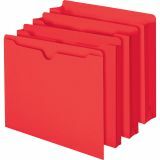 Use for photos, documents, charts and x-rays. 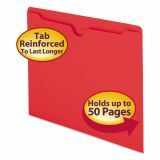 File jackets also feature 11 point colored stock, a thumb-cut front panel and straight-cut, 1/2 high, reinforced tabs."